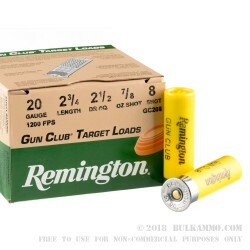 Maintain your status as a shotgunning force to be reckoned with when you invest in this 250-round case of 20 gauge shells from Remington. Remington has been around since 1816 and is the only major manufacturer of both firearms and ammunition in the country. Their products support a wide array of American shooting needs including hunting loads for survivalists, stout duty loads for police officers and concealed carriers, and high-value cartridges for professional competitors. 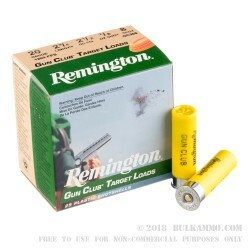 These 20 gauge shells from their Gun Club brand are subjected to quality control methods which have been developed over time as Remington's expertise has evolved. Each shell has a moisture-repelling hull that measures in at 2-3/4 inches for near-universal fit in pump-action, break-action, and semi-automatic shotguns no matter the feed system or chamber size. A smooth metallic head offers low friction for reliable chambering and ejection while a non-caustic 209 primer produces a clean spark of flame for dependable ignition. 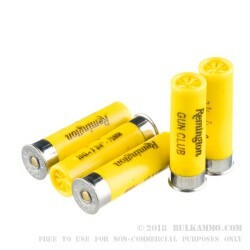 This shell load carries 7/8 ounces of #8 lead shot within Remingtons one-piece Power-Piston wad; the relatively light load along with a collapsing wad center both help reduce felt recoil without losing clay-breaking effectiveness. 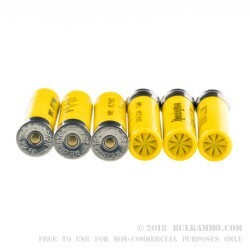 The wad also provides protection for the shot pellets so that shooters can expect rounder pellets and more dense shot clouds at longer ranges.